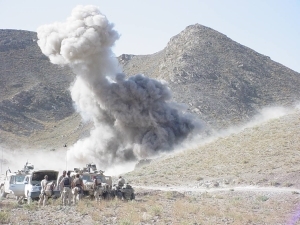 “The mountain village where the insurgents were hiding had been used to stockpile weapons since the time of the Russian invasion in the 1980s.” Insertion for the operational detachment and their Afghan commando allies was by helicopter. “Upon reaching the infiltration point, the team made a 10-foot jump out of the birds, as the pilots were unable to land. Many of them landed in a waist-deep, icy river, and with the temperatures already around 30 degrees Fahrenheit, the climate began to take its toll. In order to reach their target, the group made its way up a treacherous mountainside to the fortress-like village, which rested on a hill at about 10 000 feet. When the lead element came to within a few hundred metres of the compound, they began to receive heavy fire from all directions. 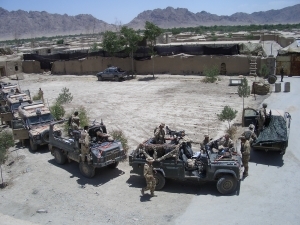 What ensued was a six-and-a-half-hour firefight, during which the team called in Air Force F-15s for danger-close air support 70 times.” Casualties on both sides were severe, but the detachment and their Afghan allies were able to break clean and withdraw due to the battle-winning intervention of Close Air Support. Air-land integration, or ALI, is a proven force multiplier, enhancing operational commanders’ situational awareness, speeding up the decision-making cycle and key to seizing and maintaining the initiative in chaotic, complex, uncertain and hostile environments. It consists of an integrated planning and execution process where intelligence, surveillance, target acquisition and reconnaissance (ISTAR) assets are combined with manned and unmanned air and aviation assets to optimise support to operational commanders plans. When employed correctly, it has proven time and again in combined arms, counter insurgency and hybrid warfare environments to be a battle winner at the tactical and operational levels, influencing strategic options and decisions in the process. African forces would benefit from adopting ALI techniques refined in the last 10 years of conflict in the Balkans, Iraq and Afghanistan to counter the threats from insurgency, hybrid warfare, organised crime and poaching. Securing the African continent with its expansive borders and resources requires effective use of limited air and land forces, budgets and capabilities. Effective employment of ALI, where qualified forward air controllers (FACs) and close air support aircrews employ joint ISTAR and fire effects, linking air and land assets to counter threats is the perfect force multiplying remedy for this conundrum. Many nations are now investing in Fast Air, manned and unmanned intelligence, surveillance and reconnaissance (ISR) assets and associated precision guided munitions (PGM). Not all, however, have invested in essential training to ensure they are deployed and operated in the most effective and efficient manner. Close Air Solutions (CAS) is a single source for international training services in all aspects of close air support for forward air controllers (FAC)/joint terminal attack controllers (JTAC), aircrew, and the wider military, safety and security community. CAS integrates: dynamic e-learning, classroom instruction, simulation, and aviation services together in a complementary mix using professional course design methodology combined with assured expert instruction. Our expertise and innovation in training is born out of a long internationally acclaimed history of providing best-of-class training to international FACs/JTACs and aircrew. We are dedicated to maintaining subject matter expertise and using the most suitable, selected, innovative training methods and media, to achieve customer training objectives. CAS addresses the dilemma of nations which have a requirement to train FACs, but may not have the resources or need to maintain an indigenous training capability. CAS proposes a ‘power by the hour’ solution for all aspects of close air support/ALI training. 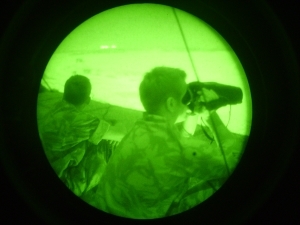 CAS trains to internationally recognised NATO and US standards. Using this benchmark, procedures can be adapted to meet national requirements. Significant advances in affordable simulation technology and fidelity means that students can learn complex and dangerous lessons in a safe environment, while enjoying full after-action review capability. The result: costly assets and weapons are employed proportionately, maximising effect, while saving lives and avoiding politically damaging mistakes. The CAS vision is a commercially available, off-the-shelf schoolhouse, able to service all aspects of close air support and ALI personnel, realising cost savings of up to 50% when compared to current methods. Atlantis Aviation, which has partnered with Close Air Solutions, is the point of contact for Africa. Atlantis Corporation represents Raytheon in South Africa and supplies the Paveway LGB Systems to the SAAF. Barry de Goede is an Atlantis specialist who, as a former British Army major, served as the senior instructor at the NATO Forward Air Controller training school. De Goede was charged with rewriting Cold War ALI, CAS, Airborne ISTAR and C4I doctrine, tactics, techniques and procedures and standard operating procedures, making them fit for purpose for 21st century combined arms, counter-insurgency and hybrid operations. Among other operations, he has extensive combat experience as a forward air controller in the field and officer commanding tactical air control party at both Battle Group and Brigade Headquarters level.